If there is one night to party, it is New Year’s Eve. 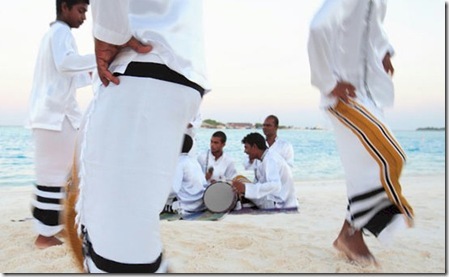 And if there is one resort to party at, it is Rihiveli Beach. There is always a party on there. The next one is their ‘White Beach Party’ on 22nd May (see below). They are advertised on their resort Facebook page and they also send out a newsletter to keep posted. 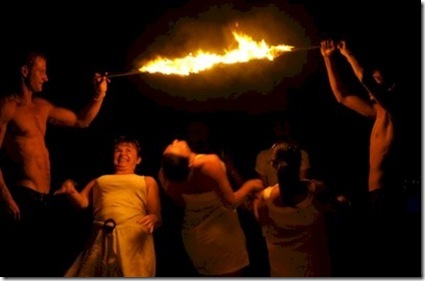 These events are not just some slap on affair to fill out the social calendar for the punters. But rather anticipated events that are part of their ebullient ‘Vive la paradis’ ethos. In fact, they mostly draw local ex-pats and others, but all are welcome. And given their French proclivities, a bottle of champagne shouldn’t be hard to come by. 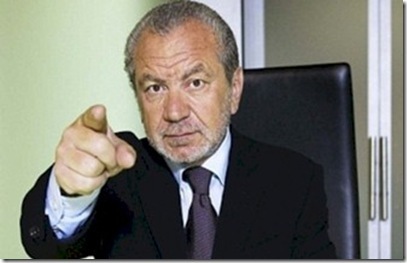 When I visited in November, a number of staff at both resorts proudly commented about the programme unsolicited. My wife and I remember that when we first came over a decade ago, many staff at resorts were from far away countries and only got to see their families a few times a year. But, the folks we spoke to in November recounted going home nearly every week on their days off and spending time with family having picnics, and playing beach football with friends. But to top it off, Landaa Giraavaru also sponsors a couple of work experience student/researchers in marine biology and its top class research and visitor centre. ‘Boxing Day’ is not the traditional day for an annual pugilistic derby in the UK and elsewhere that celebrates it today. It is the day when gifts were traditionally given to servants and tradesmen. Often ‘Christmas boxes’ of gifts or money. So it seemed like an appropriate day to celebrate the outstanding service legend across the Maldives. Especially, the super premium Maldives resorts have set higher and higher bars for outstanding service with many now providing personalised butler services. 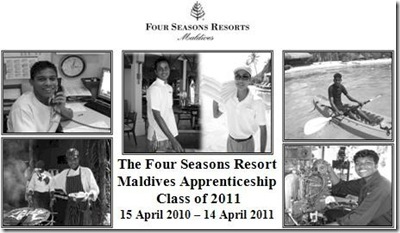 We were introduced to these services during our stays at Adaaran Vadoo and Adaaran Hudhuranfushi. 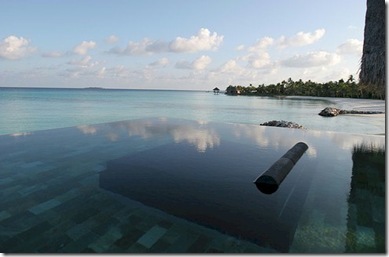 But the resort to best, from my research, is Huvafenfushi. A common highlight of the various reviews is the impeccable service there. But perhaps what tilts it for me is their impressive recognition for ‘Best Service’ on Conde Nast’s elite ‘Gold List’ a few years back in 2007 which when it was last awarded. Last chance for Christmas shopping today! We traditionally spend our family Christmas Eve going into the big metropolis of London for a bit of last minute shopping. Picking up stocking stuffers, treats for Christmas day and meal, and just soaking up the Yuletide atmosphere. Actually, it is a great day for shopping because the crowds are tapering off. Many folks are now travelling to far flung families or getting their homes ready. We found this out when one year, in a particularly frenetic advent, we had not made it by for the kids to see Santa. So we went into Harrods (between Selfridges the two best grottoes in London) and were delighted and astonished to find that the often 2-3 hour queue was only 30 minutes on Christmas Eve. 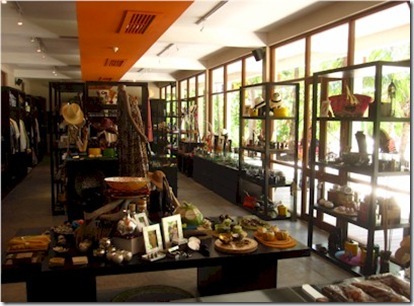 If you have left your Maldivian Christmas shopping to the last minute, the Harrods of the Maldives has to be Four Seasons Landaa Giraavaru’s gift shop. While many boutiques are little more than closets stuffed with conventional stuff you find at the airport, Landaa’s is 35 metres long packed with high quality and extensive variety product. Best of all, Landaa’s gift shop sold some of the best t-shirts we have found in the Maldives. Poor (or worse yet, no) t-shirts is a real pet peeve of mine when I travel (as I note in my recent tour wrap up). The Fours Seasons shirts were high quality cotton, enticing colours (white is boring) and subtle but classy embroidered graphic. Merry Christmas everyone! May Santa bring you lots of Maldive holiday vouchers! Pulling an inner tube behind a speed boat. Pretty basic fun and the staple of our annual coastal visits to my wife’s family’s home in Wilmington, North Carolina. Kind of lazy, easy, laugh-out-loud water fun. Then they put handles on the inner tubes…made them a bit bigger…added a few other tweaks. Now the inflatable innovation is rampant. Just walk by a Redix and you can witness the colourful variety of water fun you can now have in the wake of a motor boat. 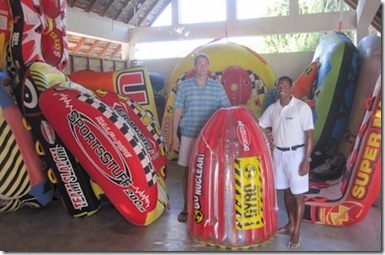 But I have never seen so many varieties of inflatable contraptions as the Four Seasons Landaa Giraavaru water centre stocks. The manager Hussain Zahid (pictured above) showed me no less than 18 different varieties. Gyro (it spins around). Granstand (you stand up) and something called 'Ray Boat' that I have never seen in all my years of water adventure. All shapes, size and colours for all sorts of rides. Maldives Complete, Seven Holidays and Mondo Maldive. That’s the Maldive aficionado’s list of top online websites about resorts. That’s what the fans say and that’s where I would point people to. 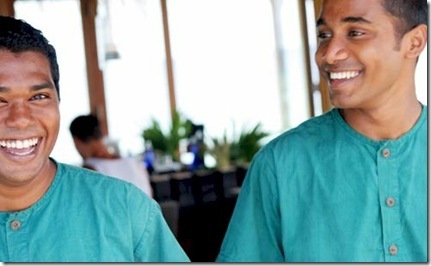 Maldives Complete’s mission was always about being comprehensive. Having all the desired info and pictures (and not a lot of redundant and extraneous bits like pictures of fish and sunsets) has been Maldive Complete’s mission from the outset. 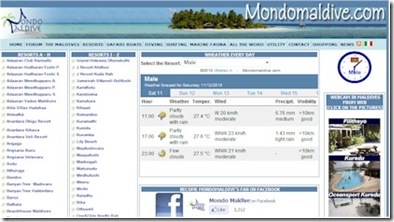 The only other website that has a similar degree of completeness if Mondo Maldives. Mondo features 108 resorts (compared to Maldives Complete’s 122 though we include a number of resorts that are offline and being built). Now Mondo Maldives have taken that thoroughness to the print world. 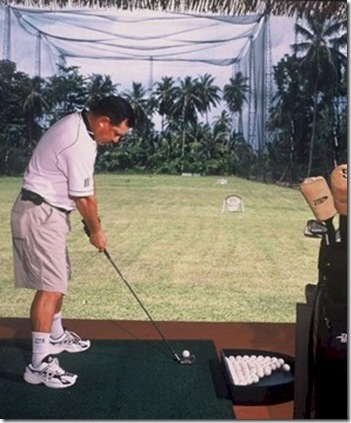 From my very first trip, the definitive book on Maldives resorts was always Adrian Neville’s ‘Resorts of the Maldives’. 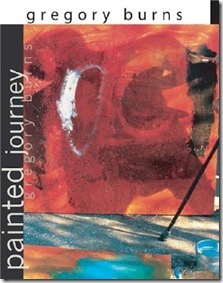 The book had the largest array of resorts as well as a balanced and candid narrative. On my most recent trip, I spied ‘Mondo Maldives’ – the book in the airport gift shop. Knowing the quality website, I took a look and was super impressed. The book was a true encyclopaedia of information on the resorts (it is advertised on their home page, but it doesn’t appear in their shop when you click on it). Mondo’s is based in Italy and the whole site is available in Italian with the core parts being available in an English version as well. Unfortunately, its rich ‘Forum’ on its site is all Italian. There’s pool seating and then there’s POOL seating! I’ve already done a post on the stunning Pool Seating of the Traders Hotel (nee Holiday Inn Male). 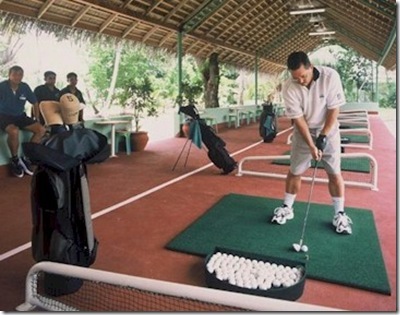 On my recent tour, I noted how the resorts we really upping their game in this regard. King-sized luxury mattresses under four-posted canopies. 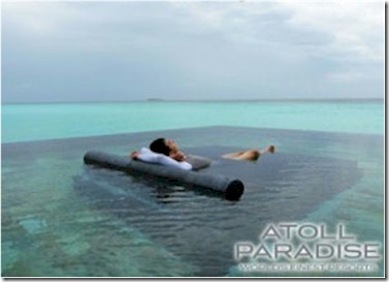 But the Atoll Paradise website caught my eye with what is most certainly the most perfect ‘POOL’ seating. The pictures say it all. Hat tip to TripAdvisor destination expert ICN05 for identifying the sub-aquatic lounger as Reethi Rah’s.